The sensational result was all the sweeter as the Saddlers had become bit of bogey side. 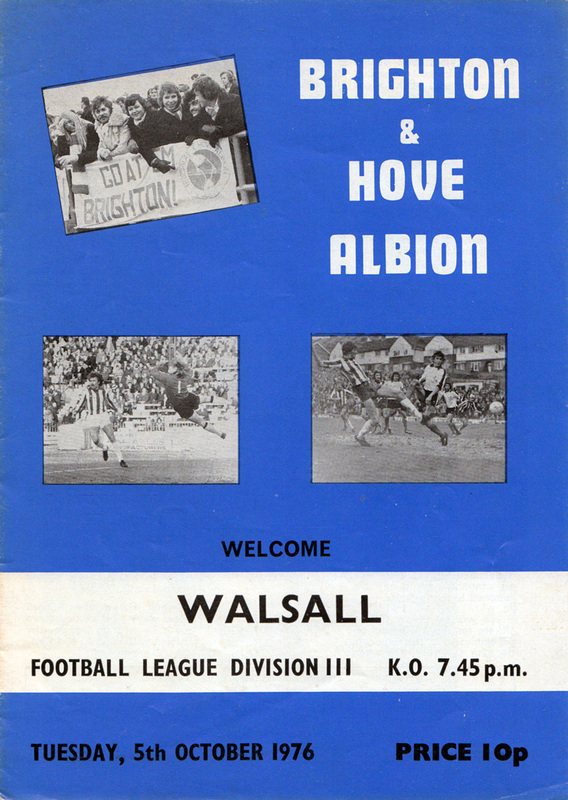 In 1974/75, Brighton suffered a 6-0 drubbing at Fellows Park before Walsall did the league double over Peter Taylor’s men the following season. 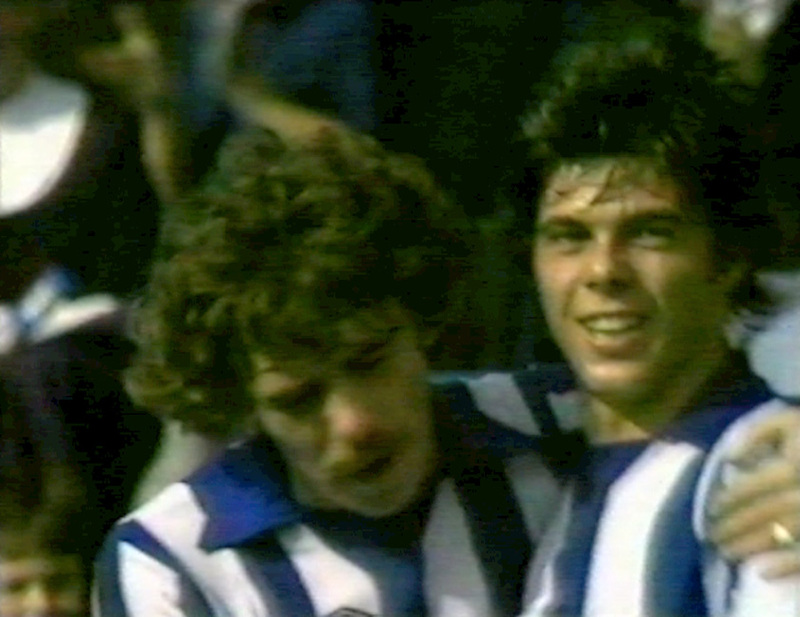 Peter Ward grabbed four goals last night and lan Mellor three as Brighton blitzed their way back to the top of the Third Division. All the goals came in a sensational second half as Brighton turned on their second seven-goaI romp in three weeks – York were their other victims. Ward, 21, is rapidly emerging as a £250,000 transfer target. A professional, for just four months, he has now scored fifteen times in seventeen League games. He began his League career last March and scored with his first kick in his first match. Now with eleven goals already this season, Ward has the sprinkle of stardust all over him. Watched by West Ham manager Ron Greenwood, he and Mellor were superb. In the fifty-first minute the flood of goals began. Ward cleverly juggled an opening for Peter O’Sullivan whose fierce shot was pushed out by keeper Mick Kearns. 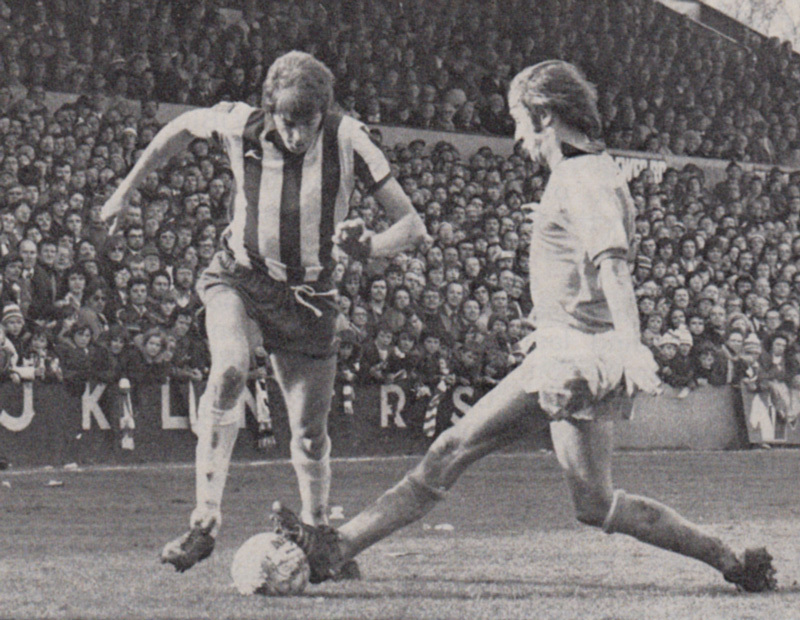 But there was Mellor to knock the rebound from close range. Five minutes later Brian Horton robbed Alun Evans, ran 40 yards and slipped the ball to Ward, who scored with a fierce rising drive. In the 61st minute it was Ward again, finishing brilliantly, and two minutes later Mellor headed home Harry Wilson’s cross. 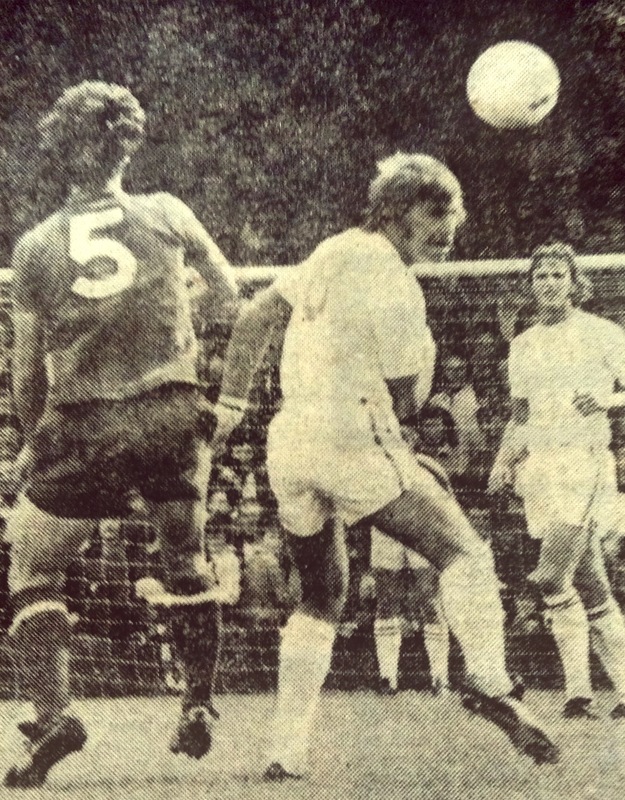 In the 70th minute Gerry Fell set up Mellor for his hat-trick, and Ward completed the rout with two in two minutes. First, he took a long clearance from Grummitt in his stride to get a superb solo goal, then he put home the rebound after Mellor’s shot had been blocked. One of the most pleasant aspects of working with the ‘Match of the Day’ team, is the chance it gives one, to meet old friends. A fortnight ago, while reporting the Second Division match between Sheffield Wednesday and Newcastle United, I bumped into a very old friend of Brighton & Hove Albion, a man who I feel had a remarkable bearing on the club’s current unprecedented successful run, Ian Mellor – ‘Spider’ to his mates, now playing for Wednesday. Except for the very newest Brighton supporters among you, I am sure that nearly all will have a great regard for Ian. 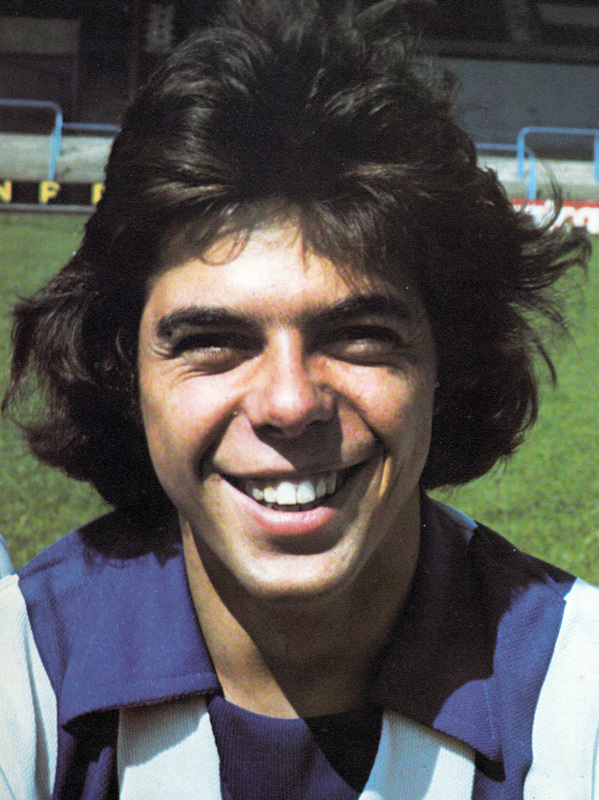 it was in Brighton’s promotion season from Division Three that Peter Ward broke the club’s scoring record, very much aided and abetted by Mellor who also found the time and skill to notch 12 League goals for himself. It was the beginning of the best spell in the club’s history and Mellor’s part in ‘assisting’ Peter, who, after all, was playing in his first full season, should never be underestimated. 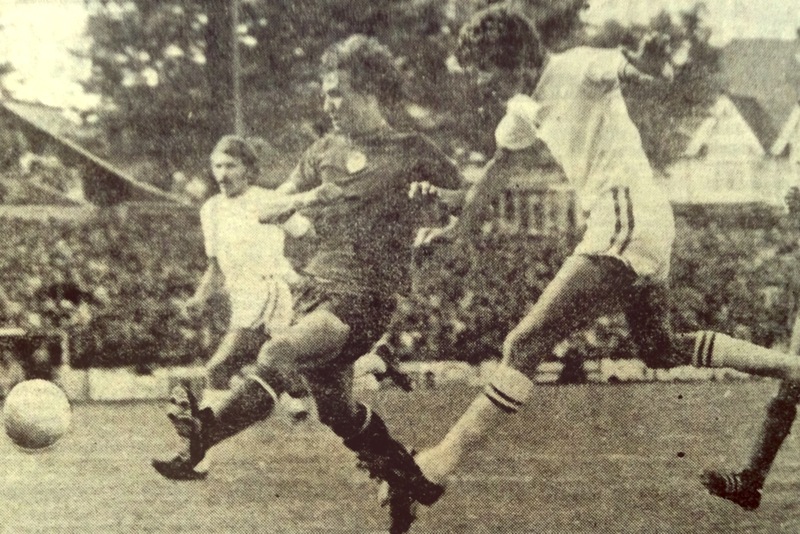 Ian had a good run in the City first team, but subsequently joined Norwich City. There, after Ron Saunders departed however, things didn’t work out so well and he was delighted when Brian Clough and Peter Taylor brought him to Brighton, then of course in Division Three, and not so very far away, at one stage, from Division Four. Albion won 1-0, and if justice wasn’t exactly served by the scoreline, Mellor himself could not have had a better introduction to the south coast fans. 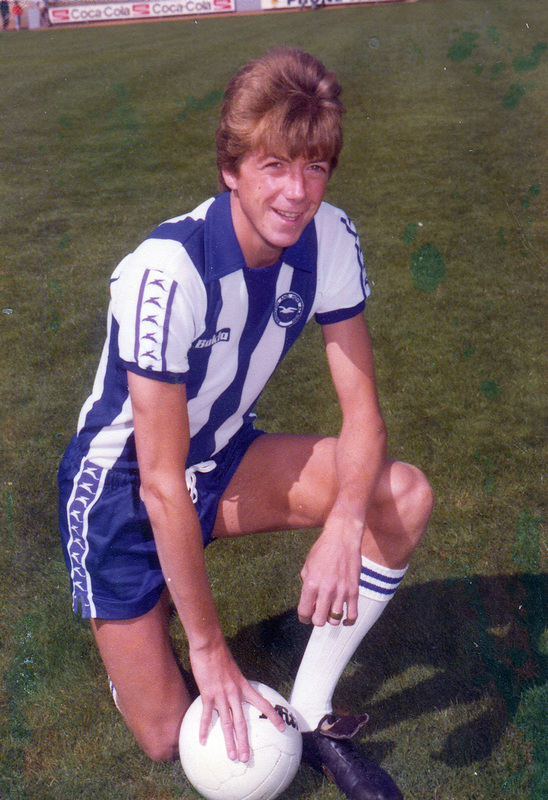 Subsequently came the disappointment of being left out of Brighton’s Division Two team, following the signing of Teddy Maybank. “I honestly felt that Teddy was not a better player than me and I was hurt’. But magnaminously, Ian also admits that the manager lives or dies by his decisions and team selection and he bears absolutely no grudge at all against either Alan Mullery (‘His record is second to none’), or Mike Bamber (‘You won’t find a more direct, honest, or knowledgeable club chairman in the game’). In fact Ian could have stayed at Brighton and who knows, may well have worked his way back into the first team. It seems to me to be no coincidence at all, that while Mellor played at Chester, a young forward called Ian Edwards, now with Wrexham and a full Welsh International began to light fires in Division Three. And nowadays, he’s at it again. 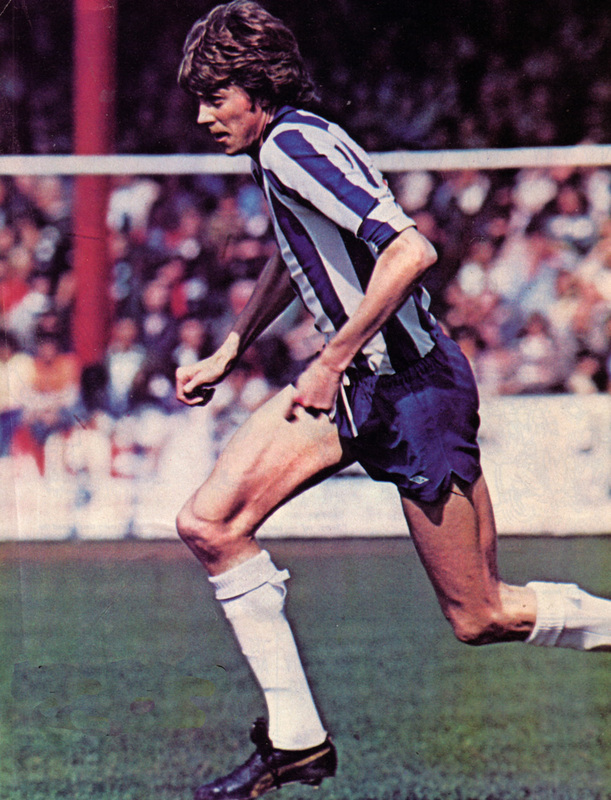 Last season, Terry Curran knocked home 25 goals for Sheffield Wednesday with Ian playing alongside him as they won promotion to Division Two, and Ian also found time to slot in 11 for himself. While Ian Mellor may not be one of the outstanding stars of League football, he’ll perhaps be recalled by the fans of those clubs with whom he’s played as more of a star-maker. I know the Goldstone fans will remember with affection – The Spider touch. 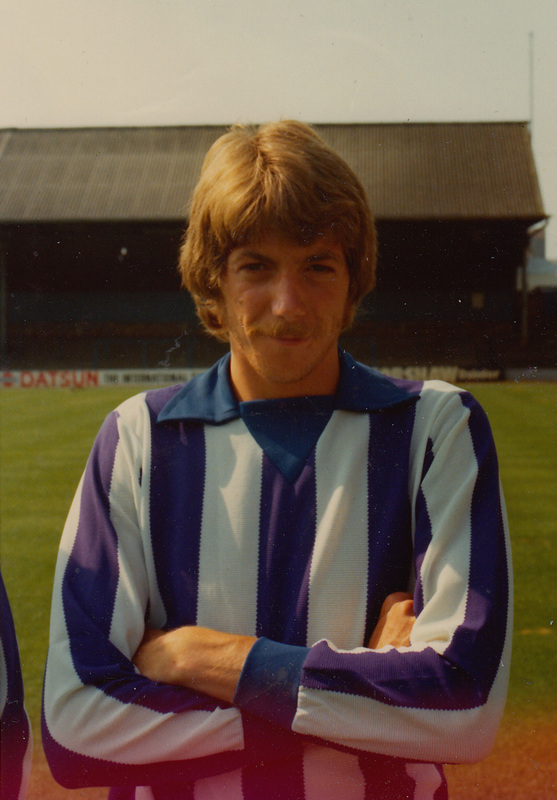 Mellor subsequently joined Bradford City on a free transfer in May 1982, before winding down his career with Tsun Wan (Hong Kong), Worksop, Matlock Town and Gainsborough. Well, here’s a treat for you. The match report from the Evening Argus, by Sydney Spicer, after the famous rout in front of the Match of the Day cameras on 18th September 1976. Brighton scored 7 – yes, (seven)! Alan Mullery must be a past master at giving players a rocket! Brighton were being held to a 2-2 draw by lowly York at half-time – and then manager Mullery went into the Goldstone Ground dressing room to talk to his boys. The result? Albion swept to an impressive triumph with five more goals. This put them back on top of the Third Division. Afterwards, Mullery said: “I had a few words to say in the interval! They went out for the second half with an entirely different attitude. Peter Ward beats a defender to get in a shot. In a splendid team performance 20 year-old Peter Ward, so quick in turning with the ball, was outstanding. Peter O’Sullivan and the leggy Ian Mellor in his first full game of the season were thoroughly impressive and substitute Gerry Fell who replaced centre forward Fred Binney after 50 minutes led the bemused York defence a merry dance. Pas de deux in the York City penalty area with goalkeeper Graham Crawford looking on. This was an inspired substitution by Mullery, who explained: “Fell was eager to get on and run at them and I felt he could pass them on the flanks.” It all went to plan. Brighton went ahead in 22 minutes with a delightful goal. Ward, seemingly hemmed in, turned smartly and sped past two defenders before lodging the ball in the far corner. 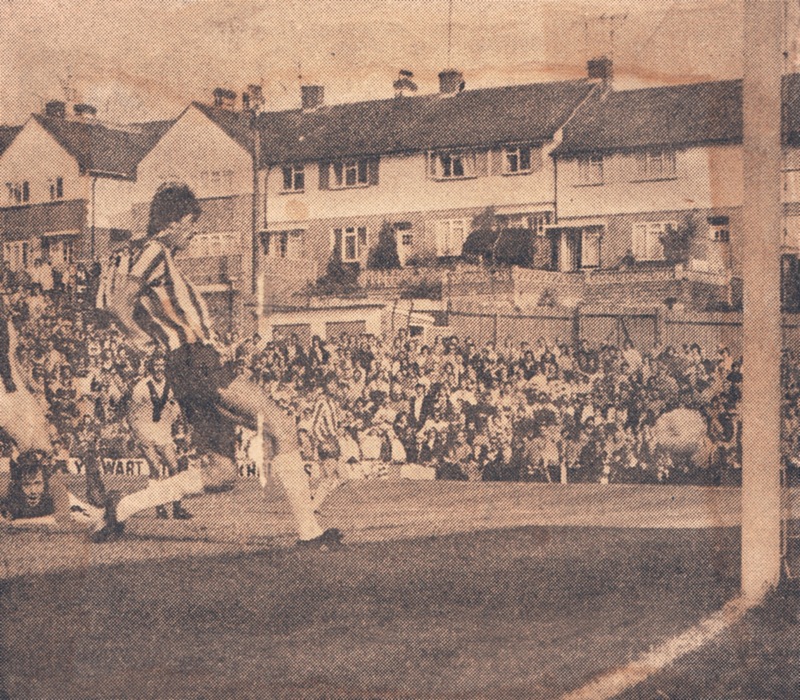 Five minutes later Steve Piper rammed home the second from Brian Horton’s free kick and Brighton looked to be on their way. Not just yet, though. Dennis Burnett breasted down a Jimmy Seal cross which he could have headed clear and there was Jim Hinch a yard or two out to slam the ball home on the half hour. 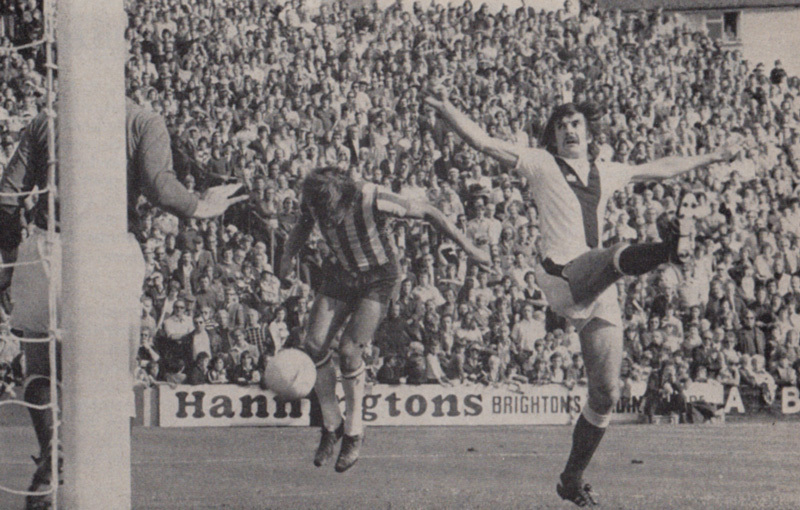 To the further embarrassment of Brighton, Piper dallied over a clearance and Brian Pollard nipped in and scored from an acute angle. After the break we saw a supercharged Brighton. In the 50th minute O’Sullivan took a pass from Ward to score from 30 yards, and Ward would have quickly added a fourth had not Peter Scott run across to kick away for a corner. But after 60 minutes a sweeping move – so typical of Brighton’s more open play in this half – involving Ward and O’Sullivan, resulted in the simplest of chances for Mellor. 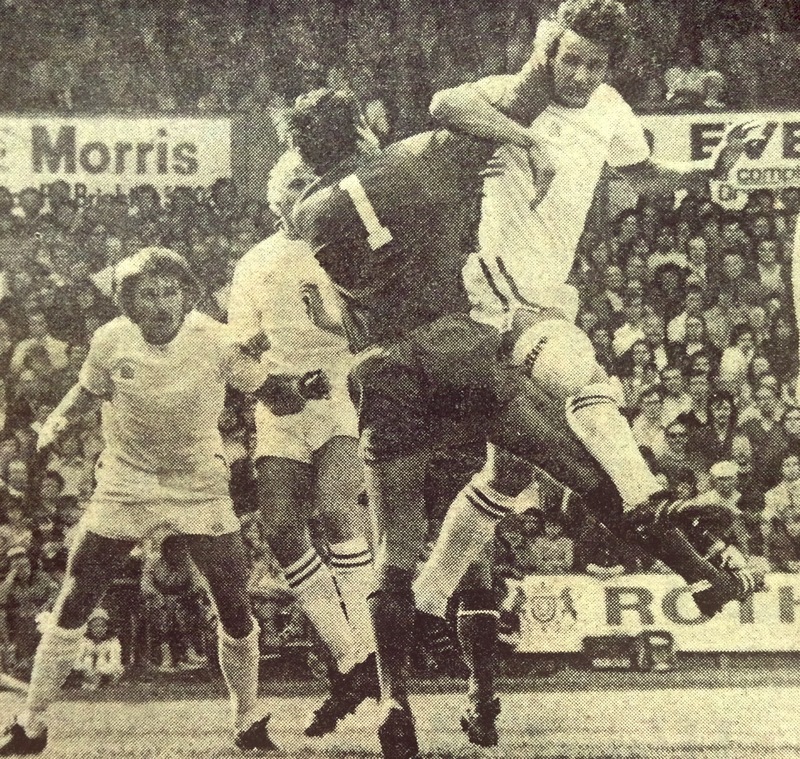 Three minutes later O’Sullivan crossed for Fell to head the fifth and, with Brighton taking the York defence apart with ridiculous ease, Ward scored from an O’Sullivan pass in 71 minutes and, to complete the slaughter, Mellor headed home Fell’s centre five minutes from the end. Ian Mellor goes through despite being impeded by the York defenders. York’s Northern Ireland international defender Peter Scott let in the scorers for the last two, and his afternoon’s misery was increased by a booking for upending Fell on one of his deadly runs. James was also booked for dissent. York: Crawford, Scott, Woodward, Joy, Topping, James, Pollard, Holmes, Hinch, Cade Seal. Sub: Downing. Another one in the back of the net for Crawford to pick out. Never in the 74 years history of the club, have Brighton and Hove Albion made such a momentous start to a season. 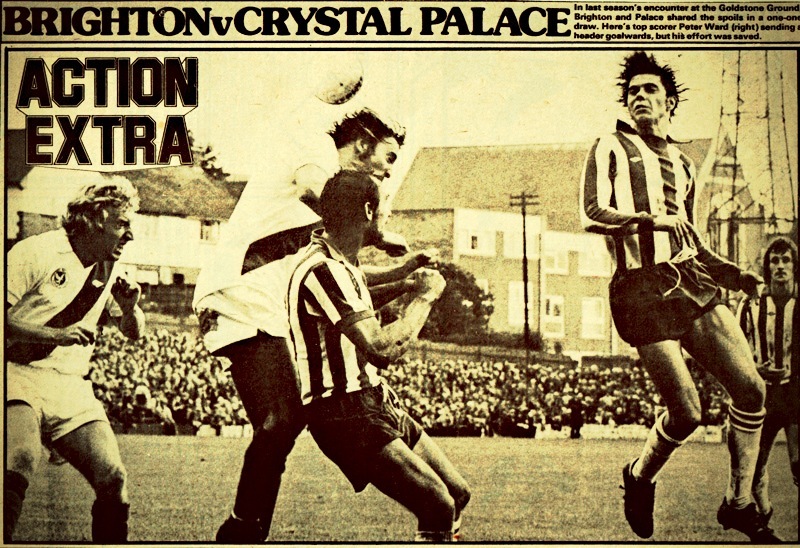 A 26,235 crowd paid £11,000 to see virtually a brand-new team defeat superior Crystal Palace by an Ian Mellor goal in the 69th minute – the first time in ten seasons that Albion have started with a win. On two counts Albion can feel a high degree of satisfaction: The team displayed sterling character to beat Palace, who were playing in the First Division two seasons ago; and the attendance was bettered by only eight turn-outs in Division One. The last time Albion kicked-off with a win was season 1964-65 when Barrow were beaten 3-1 before a 20,058 Goldstone gate. 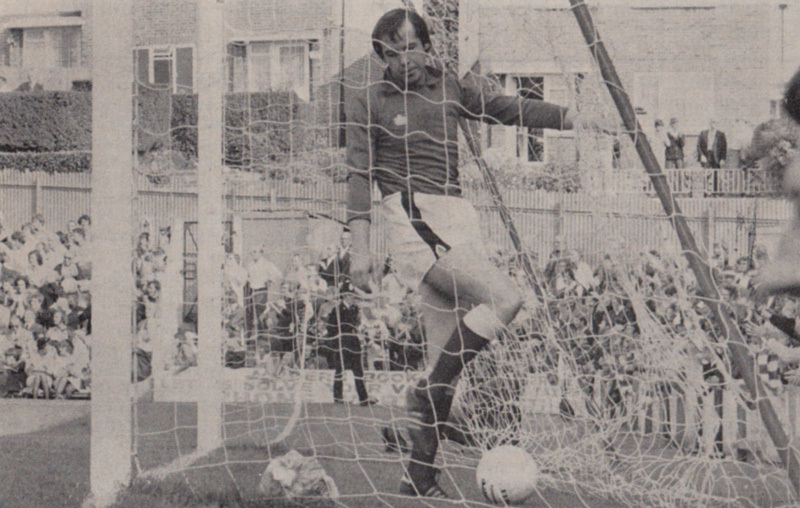 Bobby Smith pulled the crowds in and obliged with two corking goals. Albion remained unbeaten at home in going to win the Fourth Divison championship. 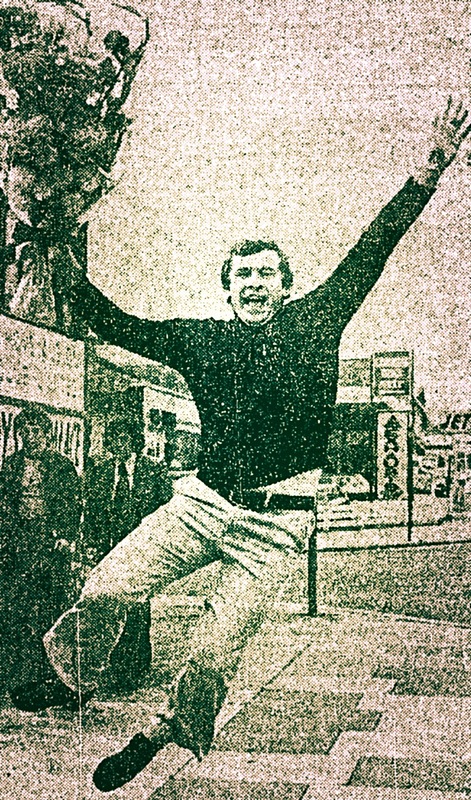 The Argus public respond quicker than most to the big occasion, the opportunity to relish flair, and until half-time they were still coming in dribs and drabs to swell the shirt-sleeved throng. Palace, of course, were attended by a large crowd, despite the misfortunes of the past two seasons, and the inevitable clashes in the North Stand where police did a splendid job in keeping rival factions apart. This is the ugly side of football, the tedious side of the game that only deters decent spectators from enjoying a match. Given the same set of circumstances 10 years ago, before violence became a way of life for a vicious minority, there would have been 30,000 for the start. Overall, Football League attendances were down on the corresponding time last season. But Albion, as usual, are very, very far from being an average club. The directors hoped for 25,000, and were not disappointed. They badly need money after massive expenditure of the past few months and happily the public responded by keeping their side of the bargain. From a playing point of view, one should not expect too much. There will not be many cleverer sides in the Third Division than Palace, nor do I expect to see teams capable of generating industry on the Brighton side. Peter Taylor and trainer-coach Gerry Clarke have quickly assessed the strengths and weaknesses – hence great emphasis in pre-season training on work rate. It will take time to achieve a blend of skill, and Taylor only knows this too well. 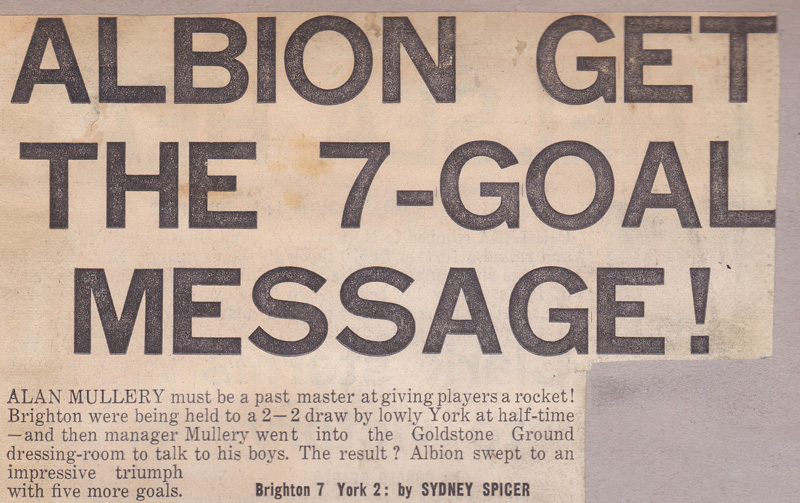 But every crowd loves a trier, and Albion had eleven who never knew when they were beaten. It is not surprising that the owner of such long legs and thin frame as Mellor should be dubbed as Spider by his mates. He is a player of deceptive pace, and is at his most dangerous off the ball. The goal was created out of nothing. 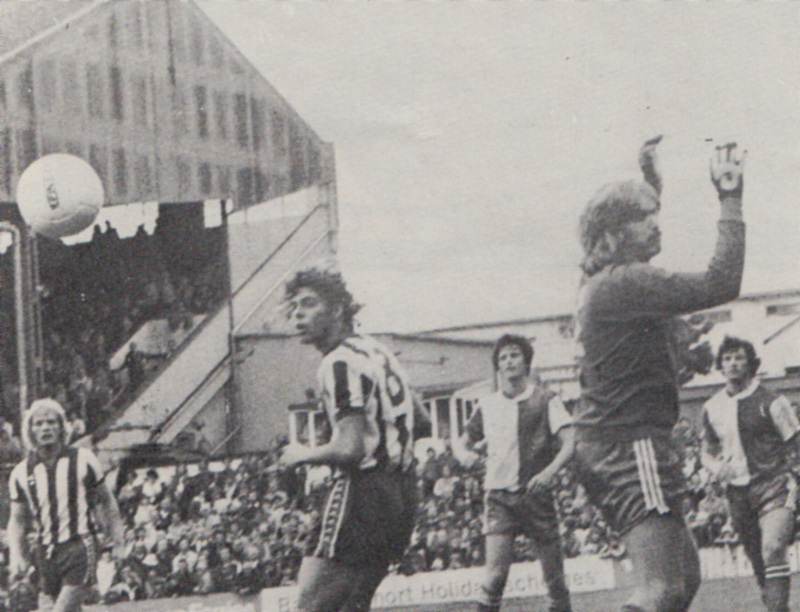 Fred Binney flashes a header wide after beating Derek Jeffries. Around him vigorous Ricky Marlowe and busy Fred Binney put in an unselfish 90 minutes, and the transformation promised in Peter O’Sullivan was there for all to see. There is far greater urgency about O’Sullivan, as Taylor has promised. Elsewhere the theme was work, and not once did a player lose control when confronted by higher skills. Rogers often threatened, but the old hands were not far wrong in saying that he seldom has a good match against Albion. For me, Whittle was the chief danger in a side that badly needed power. Albion: Grummitt, Piper, Wilson, McEwan, Rollings, Govier, Welch, Binney, Marlowe, Mellor, O’Sullivan. Sub: Towner. Crystal Palace goalkeeper Paul Hammond misses his punch and the ball runs down between him and Albion’s Andy Rollings as Fred Binney and Ricky Marlowe move in following a corner at the Goldstone. 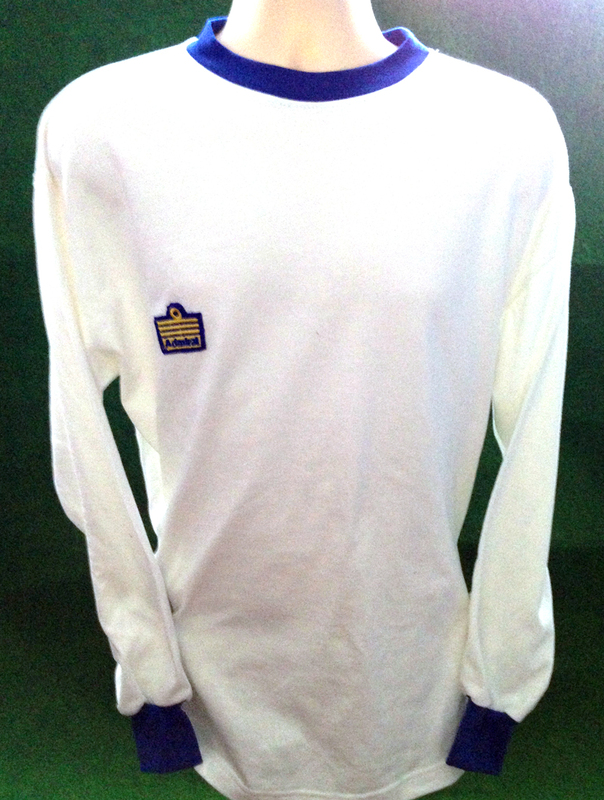 No, this is not a Leeds United shirt! This is a pimped-out version of the very ‘plain Jane’ Brighton home shirt from Peter Taylor’s first season in sole charge at the Goldstone in 1974/75. As you can see, not only did Albion fans have to put up with their manager Brian Clough defecting to Leeds, but our traditional and beloved blue and white stripes were ditched in favour of a design by Admiral that echoed the kit worn by the Elland Road side. To add a bit of flourish, the shirts were originally worn with white shorts that had two blue stripes running down the side and with white socks featuring two blue rings. While controversial, the move to all-white had a precedent at the Goldstone earlier in the decade. 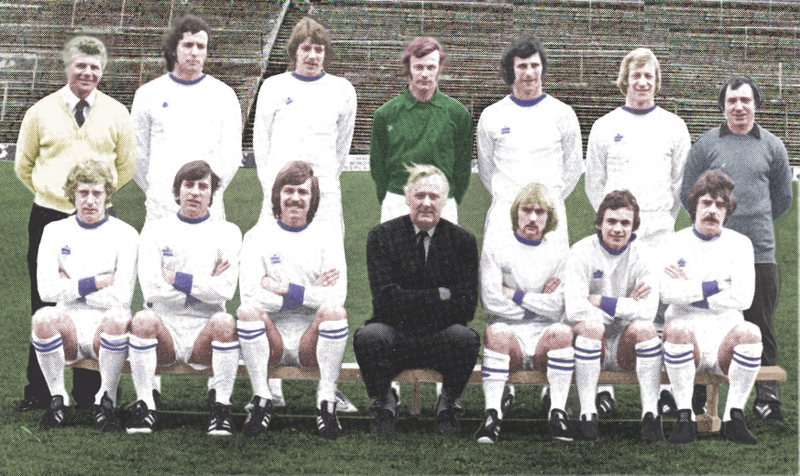 Before Brighton boss Freddie Goodwin had left for Birmingham City in the summer of 1970, he had instigated a change to the team’s colours to this aesthetic, perhaps in admiration of Leeds or maybe he thought it would help us play like Real Madrid. Or could it be that he just liked how milky-white kits shone under floodlights during night-time matches? Whatever the reason, that radical change lasted for a single season, however, in the first campaign of the Pat Saward era. 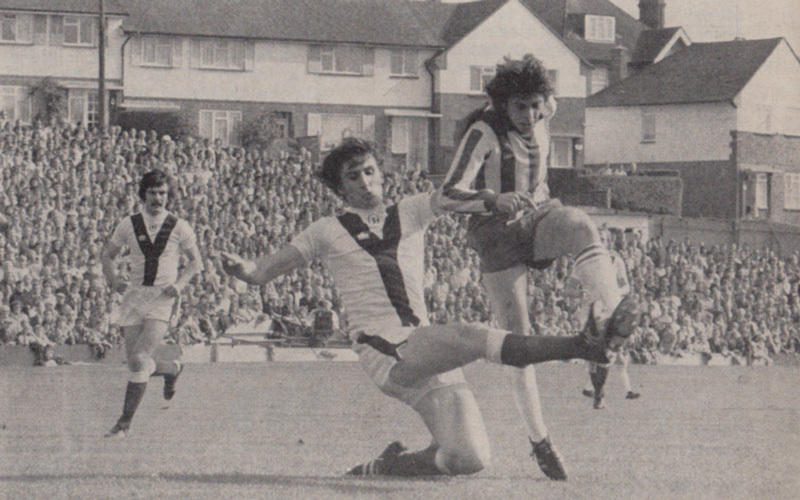 At least the white shirt from the earlier season had the letters ‘B&HAFC.’ This one of 1974/75, with the identical blue round neck and shirt cuffs, had nothing that identified it as belonging to Brighton & Hove Albion. 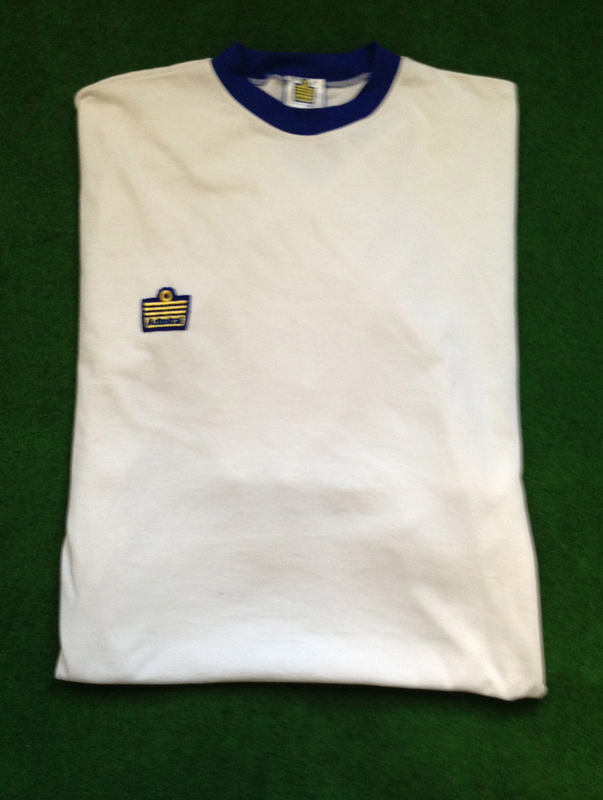 Stingily, it also offered none of the design innovations that Admiral became synonymous with during the decade, such as tramlines down the shirts and shorts …or even sock tags which featured mainly at Elland Road in kits manufactured by Admiral (If you’re going to copy Leeds, at least copy sock tags!) And yet, as if to rub your nose in it, Admiral did manage to get their own logo on. Strangely, given the plentiful supply before, there’s a paucity of colour photography of Brighton & Hove Albion players during 1974/75, apart from this photo by Crystal Palace fan Paul Wright which understandably is from quite far out, so you can’t see the detail on the shirt. So, from black and white photos, I was unable to ascertain the colour of the Admiral logo until Phil Shelley from Old Football Shirts was helpfully able to confirm it as yellow with a blue outline, having chatted to a few ex-Brighton players at the Alan Mullery special celebration dinner event last year. Powered with this knowledge, I ordered a blue round-necked white shirt from Toffs. Then I proceeded to get a yellow Admiral logo unstitched from another shirt and sewn on to it although, judging from photos, I think the originals had the logo as an ironed on transfer. I even got the Admiral neck label added on to make it look more authentic when it is anything but! 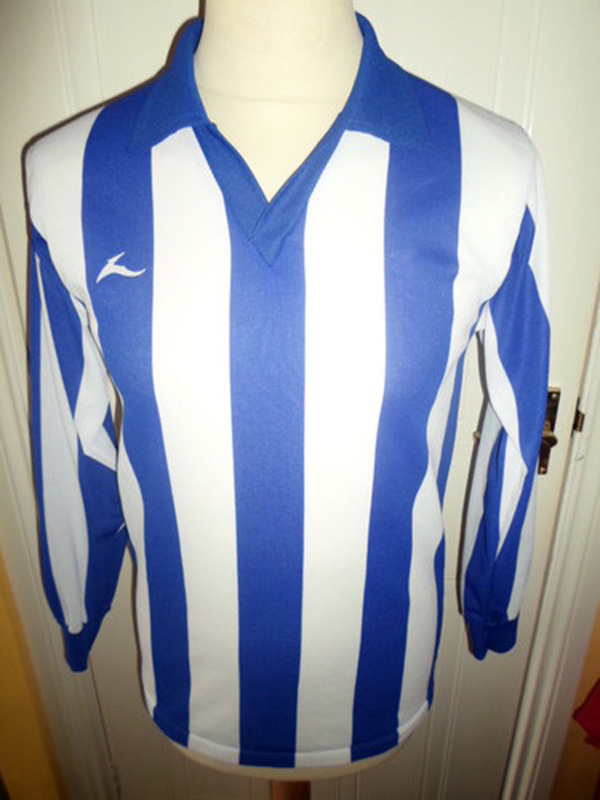 Unless any found their way out, what you are looking at could be the only 1974/75 Brighton home shirt in existence, albeit as a reproduction. 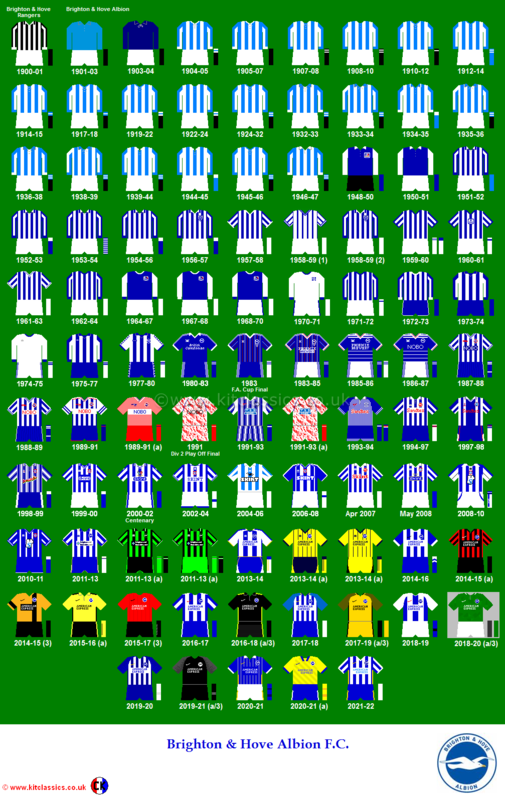 Every Albion fan over a certain age knows the famous Brighton home shirt of the late 1970s, with the buks running down the white sleeves and round Seagulls badge. But what about this one? Well, this shirt design, with blue and white striped sleeves and no buks down t’sleeves (and no badge either!) was also an Albion home shirt of the Mullery years. 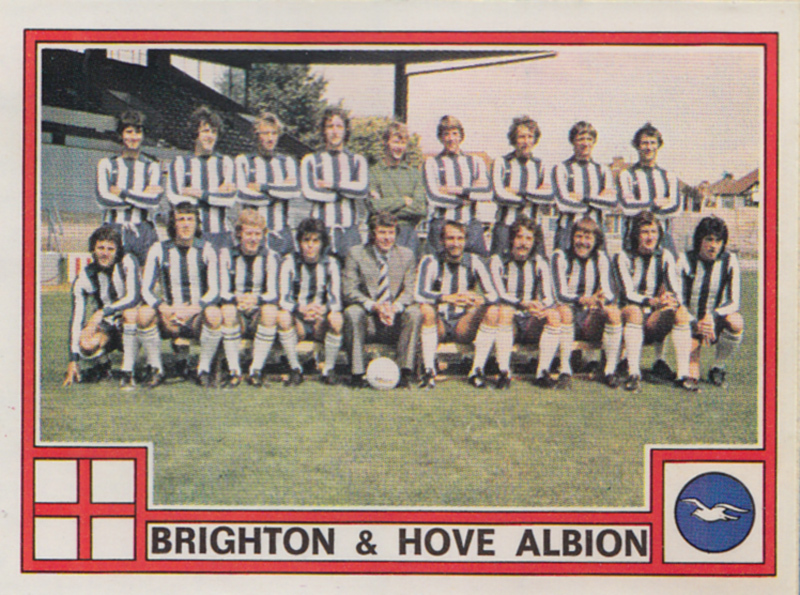 In 1976/77, Brighton had crazily inconsistent manufacturers’ branding on their kit. White or black Umbro logos adorned the home shirts. Then, sometimes, there was no branding (maybe some ironed on logos fell off!). At other times, there was an Umbro logo on the shirts and a Bukta logo on the shorts. And sometimes, different Albion players in the same game had different combinations. It was an absolute mess! Certainly wasn’t someone with OCD in charge of the player’s kit. (Infuriatingly, other players in the same game, such as Peter Ward, did not have this logo on their shirt. His was unbranded). 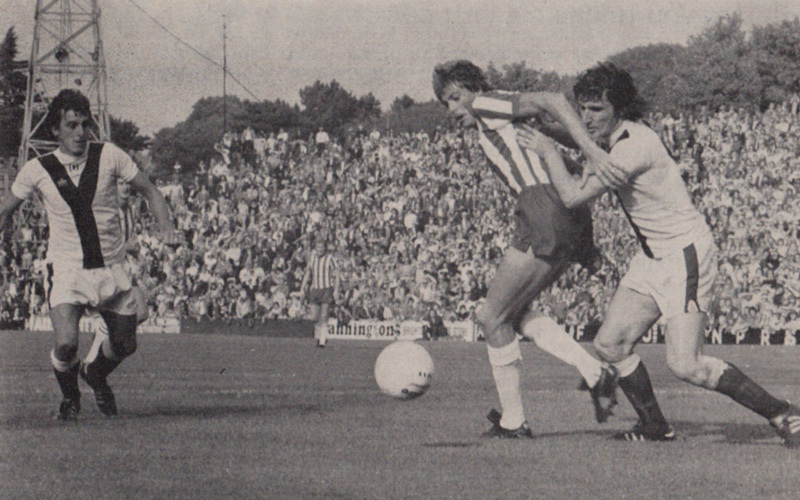 However, Ward did get to wear this Bukta-stripey-sleeved shirt over a year later in August 1978, in a pre-season friendly against Queen’s Park Rangers at the Goldstone. By that time, the classic Buk-sleeved Bukta shirt, that we all know and love, had been worn for a good year within its three year lifespan. So it’s a mystery why the first ever Bukta design made a brief revival, now with shorts that didn’t particularly match its aesthetics. Probably to confuse Albion shirt connoisseurs thirty-five years down the line, I expect! Yeah, that’d be it.